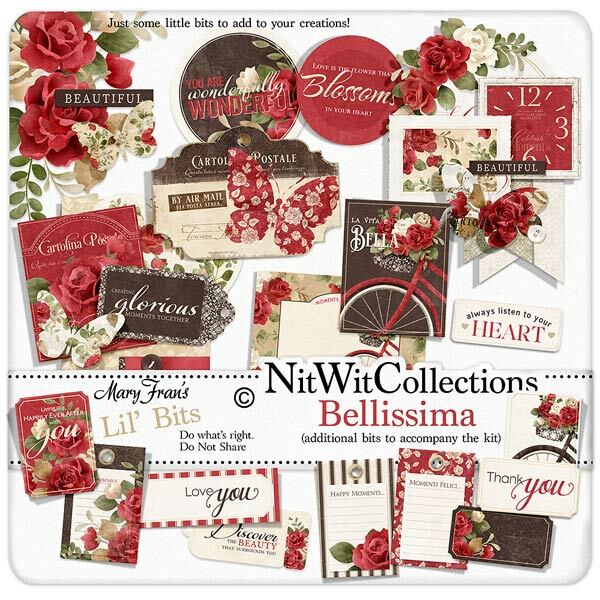 Lil' Bits "Bellissima" expands the creative options for your digital element choices when creating your scrapbook layouts, mini albums and cards. These fully finished, clustered elements make creating so much easier and give you the perfect starting point. Don't miss out on these digital elements as they are not included in the FQB "Bellissima" Collection so please don't miss out on owning and creating with these elements! 1 Circle label in the striking black, red and white colours of this digital kit - "You are Wonderfully Wonderful"
1 Circle label in red - "Love is the Flower that...."
1 Cluster of elements that includes the cottage chic red label, heart and word tag - "Creating Glorious Moments Together"
1 Journal card in black with the red bike - "La Vita E Bella"
1 Journal card exuding romance with the floral background, bike, and writeable tag area - "Moments to Cherish"
1 Label - "Love You"
1 Label - "Always Listen to your Heart"
1 Tag - "Discover the Beauty that Surrounds You"
1 Ticket - "Thank You"
1 Vertical ticket that is filled with roses - "Living My Happily Ever After With You"
1 Cottage chic vertical ticket in white with the black bicycle...can you feel it? ?